Fritz Paul Schmenkel was born on February 14, 1916, in Varzovo near the town of Stettin (now Szczecin). His father, Paul Krause, was a communist and did not openly support the policy of the National Socialist German Workers’ Party (also known as the NSDAP or the Nazi party). At one of the protest demonstrations in 1923, Krause was shot and killed. Fritz followed his father’s views and joined the Communist Youth International of Germany. He worked at the Varzovsky brick factory and later at a factory in the city of Bytom. In December 1938, Fritz was called to the Wehrmacht, but he refused service, citing illness. For evasion from service, Fritz was put in the prison of Torgau. At the beginning of the Second World War, he agreed to join the Wehrmacht. In October 1941, after his release from prison, Fritz was sent to a school for junior artillery commanders. After training to the rank of corporal, he was sent as part of the 186th Infantry Division to the Eastern Front. In November 1941, Fritz Schmenkel escaped from his military unit. At first, he was hiding in the village of Podmoshye, located in the Smolensk region. However, on February 17, 1942, while in the village of Kurganovo, Fritz was detained by German soldiers and was taken into custody. 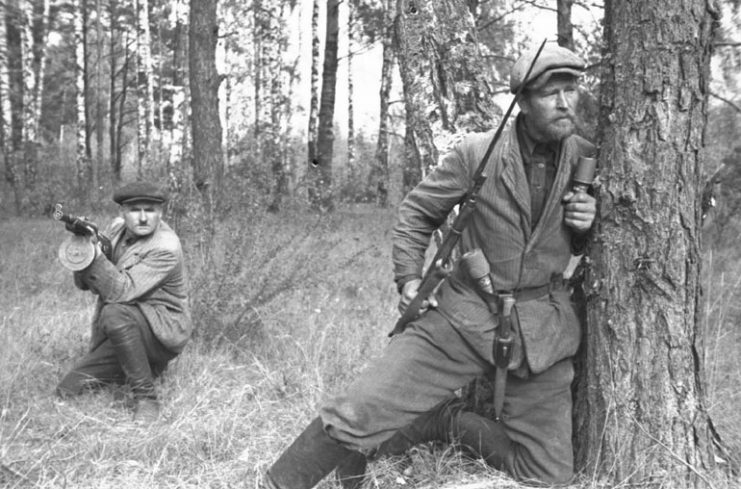 On the same day, the partisan detachment «Смерть фашизму» (Death to Fascism) captured the village. The commander of the guerrillas, learning about Fritz, decided to take the German into his unit. 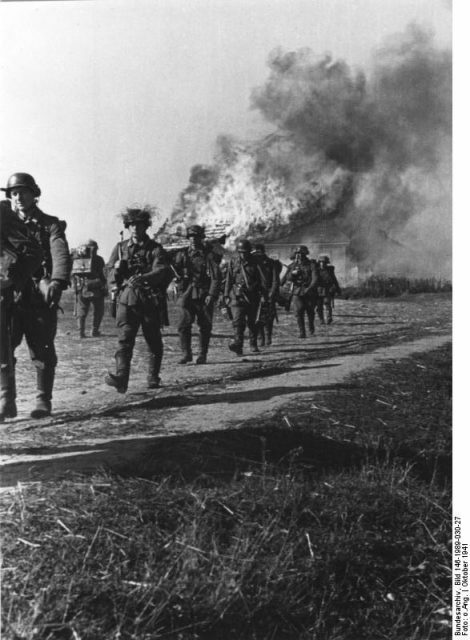 At first, the partisans subjected the only German in their ranks to negative treatment. Some regarded him as a spy and wanted to shoot him. However, he proved himself during an intense battle where the partisans could not neutralize the German army unit they were facing. Fritz asked for a rifle and killed a German soldier with his first shot. After this, the partisans gave Fritz permanent weapons as well as the name “Ivan Ivanovich”. 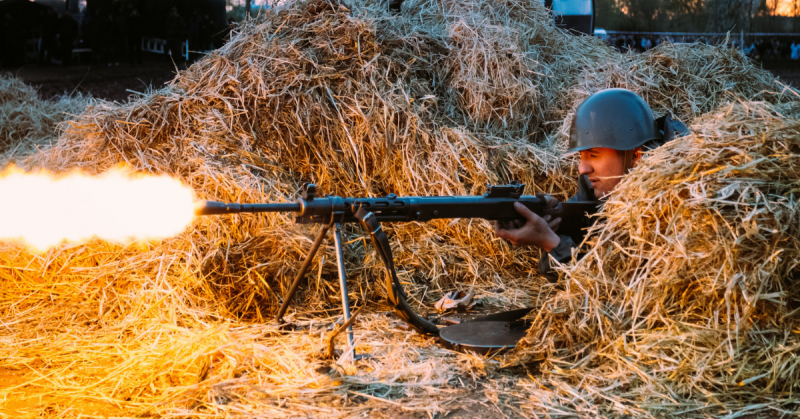 “Ivan Ivanovich” began training partisans on how to shoot with German weapons. In August 1942, thanks to his German origin, Fritz and a group of partisans dressed in German uniforms managed to capture 11 policemen. In October 1942, Fritz put on the uniform of a German general and stopped a German convoy carrying food and ammunition. 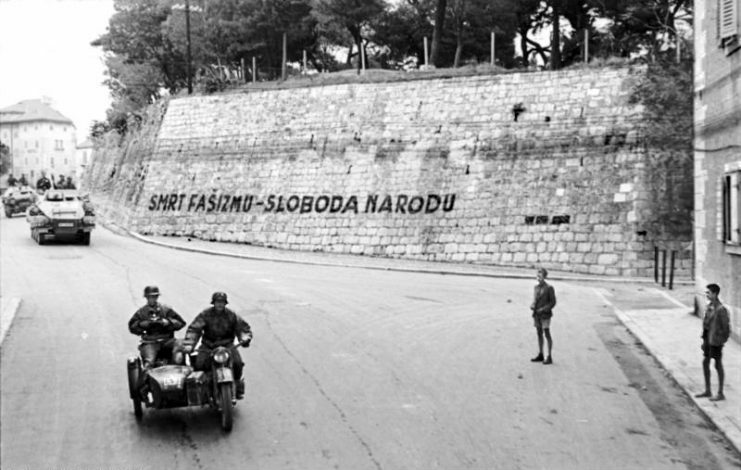 He ordered the convoy into a forest where it was captured by the partisans. It wasn’t long before German command learned about the actions of the German soldier “Ivan Ivanovich” who fought with the enemy. A large reward was offered for the head of Fritz Schmenkel. “Who will catch Schmenkel, he will receive a reward: Russian 8 HG land, house, cow, German soldier – 2 thousand marks and 2 months of leave” – from a German leaflet. Death to Fascism carried out operations in the Belsky and Nelidovo districts of the Smolensk and Kalinin (now Tver) regions. 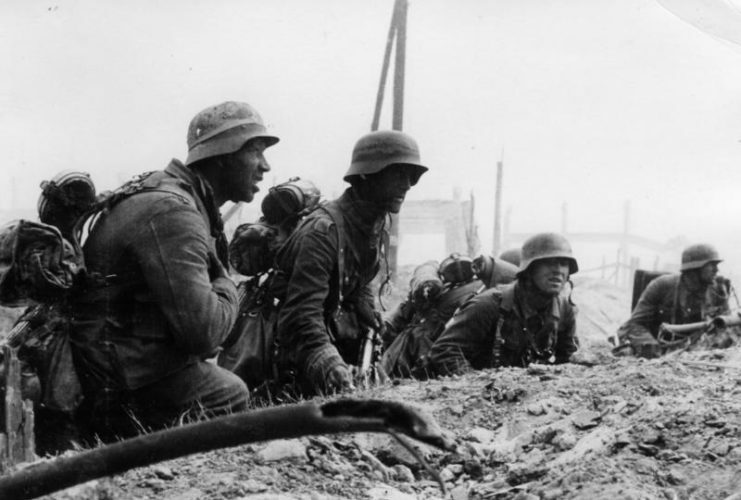 However, in early 1943, the detachment was divided into several small groups. 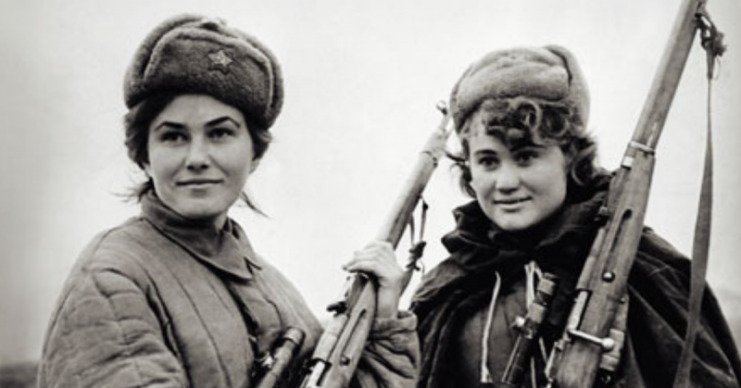 Then, in March 1943, this territory was liberated by Soviet troops and most of the guerrillas were sent to Moscow. In June 1943, Fritz Schmenkel was transferred to the reconnaissance department of the Western Front. He was soon trained up and given the post of deputy commander of the Sabotage-reconnaissance group. The function of this group was to conduct special assignments in the northern region of Orsha. In December 1943, Fritz, along with two scouts, Ivan Rozhkov and Vasily Vinogradov, was sent to the front line. 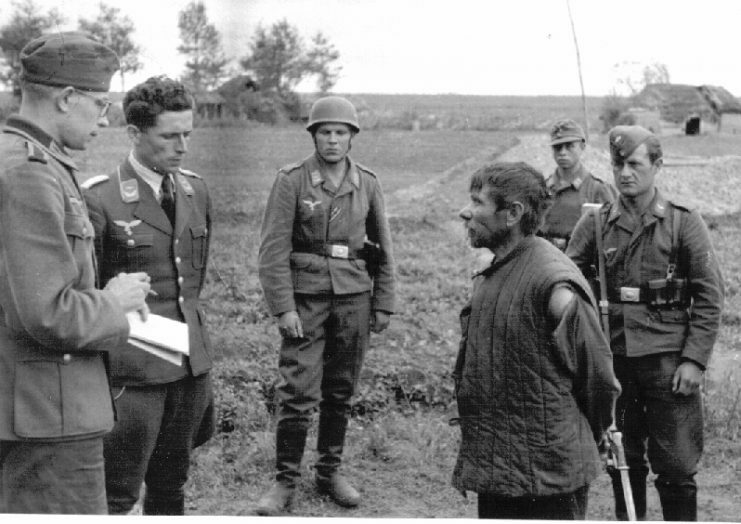 In early 1944, he was captured by the German occupation authorities and on February 15, 1944, sentenced to death. 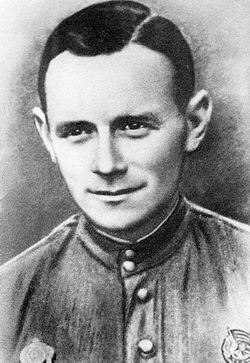 On February 22, 1944, Fritz Schmenkel was shot in the city of Minsk. In 1961, the KGB found information about a gang of policemen who had been killed by partisans led by Fritz Schmenkel. During the next three years, further information was collected about him. In addition to Fritz’s military merit, they managed to find out that he had been married to Erna Schafer and they had had a son and two daughters: Hans, Ursula, and Krist. In 1977, the film “I want to see you” (German Ich will euch sehen), was shot in the German Democratic Republic. It tells the story of Fritz Schmenkel. In a further honor, his name was used for the 1st Fighter Squadron (Jagdfliegergeschwader 1 (JG-1)) Air Force GDR. In East Berlin, there was a street (from 1976 to 1992) called Fritz-Schmenkel-Straße. 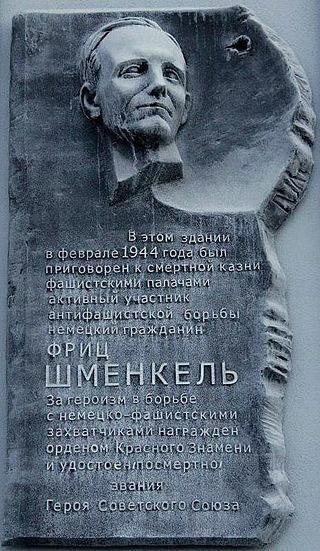 Fritz Schmenkel is also the name of a street in the city of Nelidovo (Russia) and there is a memorial plaque in his honor in the city of Minsk.